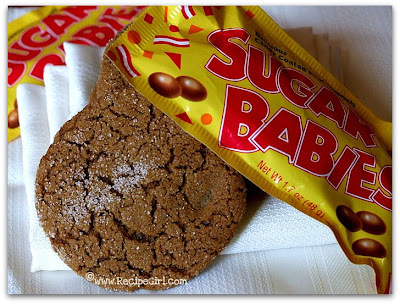 Sugar Babies were among my favorite Halloween treats to acquire when I was a young trick-or-treater. You don't see them around too much anymore. Stores with well-stocked candy sections will carry them, and places like video stores and movie theaters have the super-sized boxes. If you're lucky, you may find some among your children's Halloween loot. 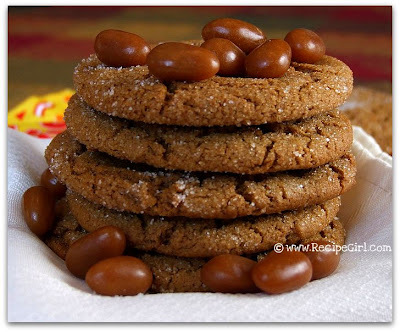 This is an excellent recipe for caramel lovers as well as purveyors of chewy cookies: Molasses Cookies with Sugar Babies. You may be more familiar with the Sugar Daddy. (Kind of a funny side note... some interesting things came up when I googled "sugar daddy"!) The Sugar Daddy originated in 1925 as a caramel lollipop that was dubbed the "big daddy" of all lollipops. The Sugar Daddy got a Sugar Mama in 1935 and Sugar Babies followed the same year. The babies are like little caramel-filled, chewy jelly beans. 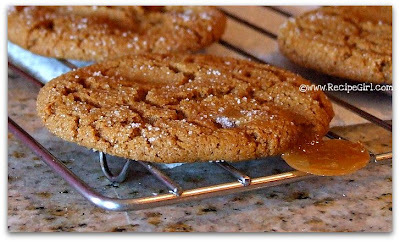 When you add them to a molasses cookie batter, they melt inside the cookies to create a chewy, caramelly texture. As I rolled the dough into little balls with those jellybean-like babies prominent in every spoonful, I was a little skeptical how well they would incorporate into the dough. No worries... they fit in just fine. A few of them did this... just a few. I actually liked these rejects the best anyway as that pool of caramel is a crispy, tasty little treat (and if you don't like it so much it just breaks off anyways). These were a big hit at a recent playdate... with both the adults and the kids. The cookies were still good days later... still remained chewy (think- caramel!) And they were really good dipped in MILK.